Microsoft Outlook is a platform that is appropriate for every organization to maintain the business productivity. It brings forth some amazing features with a simple Graphical User Interface. Consequently, dependency on Outlook is increasing day-by-day. Numerous enterprises want to use this email client for the purpose of cross-communication and exchange of crucial information. However, like any other email application there are some challenges users have to face while accessing database on this. One such issue is of duplicates files in it. It is possible that there are emails items in Outlook that are same or duplicate. Moreover, there could be some calendars, contacts, tasks, journals, notes, etc. that have their replica on Outlook. These duplicates results in the bigger size of the mailbox, which ultimately leads to corrupted or broken PST files. Now, to prevent this condition, there is a need of a relevant Outlook duplicate remover tool that can deal with this issue. So user should free download Outlook PST Duplicate Remover to remove duplicate emails from Outlook 2016, 2013, 2010, 2007 and older versions. As there is an immense increase in the technology, there are various products to meet the requirements of businesses or users. Outlook PST Duplicate remover belongs to the same category, which is designed to delete copied data from Outlook data files. The application consists of advance algorithms making the complete process easy and simple. Moreover, users can access this utility in any of the versions of Windows Operating System. Users can save the resultant file in any of the desired location and can even see the report of the process. Apart from this, there are some more useful features as mentioned in the below section. Remove Duplicates from Outlook in Bulk: Outlook 2016 duplicate remover permits users for extracting copied items from multiple PST files in batch mode. Users can add a particular folder consists of various PST and erase duplicates from every Outlook data file and from the folders in it. Add Files: To add multiples PST files simultaneously and remove duplicate emails from Outlook 2016, 2013, 2010, 2007 and older versions . Add Folder: Hit on this button and add the folder, which contains numerous Outlook Data files. 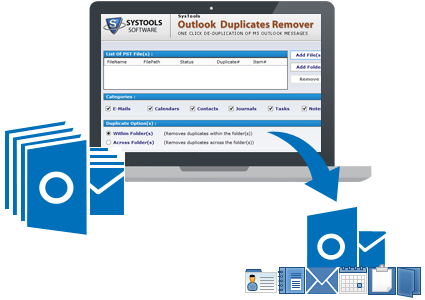 Remove Duplicate Items from PST: Outlook 2013 duplicate remover has the capability to delete duplicate emails along with other items such as contacts, calendars, tasks, journals, notes, etc. It brings forth an option to mark or unmark Outlook items so that a user may perform the task of selective items removal if needed. Eliminate Duplicates Within Folder: This option allows removing the duplicates emails from a folder of Outlook PST file. Eliminate Duplicates Across Folder: With the help of this option, it becomes easy to remove the similar items across different folders of PST. List PST Along with Attributes: Users can add as many PST files as they want and execute the process of duplicates removal. As soon as the process of deduplication is finished, the Outlook PST duplicate remover displays a completion report, which includes File Name, path, name items, etc. Free or Trail Version: This is the free edition of Outlook 2016 duplicate remover. It helps users to understand the entire working of the software in free of cost. They can download this edition first and if they find it a relevant and safe utility, they can buy it full edition. As the matter of fact, that it is free of cost therefore, it can only recover 25 items only. Full or Licensed Version: With the help of Outlook duplicate remover full version, users can perform the recovery process without any kind of restriction. Users can order the full edition from the official site after they get satisfied with the free version of software. It permits users for the deduplication of emails, calendars, notes, contacts, etc. It cannot be accessed in Mac OS X platform. Only 25 items can be recovered with trial version of software. Outlook PST duplicate remover is one of the prominent products used for the deletion of duplicate items from MS Outlook profile. It comes up with so many incredible features as we have discussed. After considering the complete functionality of the software, we can rate this program 9.9 after 10. This deduction in marks is just because of the limitation associated with trial version otherwise, it deserves full rating.